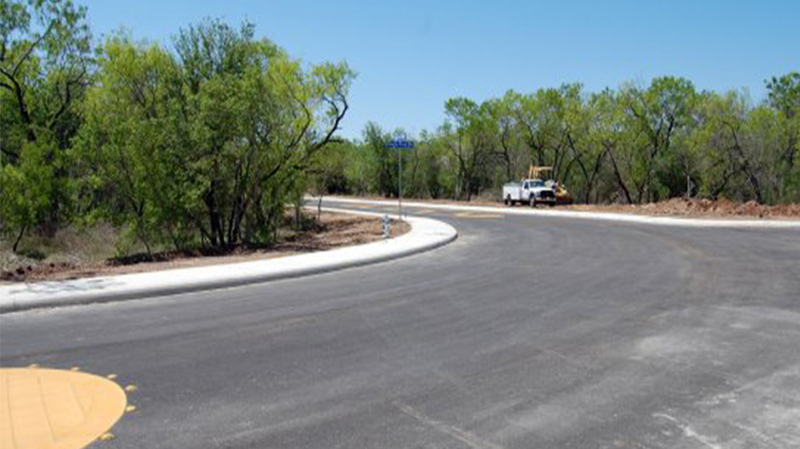 In February 2013 Yantis Company completed site improvements for the Eagle Ford Business Park, located on south side of San Antonio near the intersection of Loop 1604 and Highway 37. Yantis constructed the primary road running through the business park, measuring roughly 2,800 ft.
Yantis’ scope of work involved all earthwork, water, sewer and drainage improvements. Yantis Company paved the over $1.5 million project in three months beating the contracted schedule by one month. The business park is owned by Hughes Sage and was designed by Pape-Dawson Engineers. The developers of Hughes Sage have been Yantis Company clients since the 1980’s and Yantis has constructed other developments around town for them including Deerfield, Falcon Heights, and Judson Valley.